Editor’s note: In the following excerpt, Goldstein is an 18-year-old New York University sophomore. Saturday, October 4, 1986, 5:43 p.m. I am wearing my best day-into-evening outfit. On top: a bright magenta cotton turtleneck beneath my most favorite item of clothing, a vintage short-sleeved black knit bolero jacket handed down to me from Grandma Mimi. It boasts an elaborate paisley pattern woven in golden thread. On the bottom: a black A-line skirt falling just above my knees, black tights, and knee-high black leather boots with a walkable heel. My hair, boasting new blonde highlights and freshly trimmed bangs, falls to my shoulders. From my ears dangle gold teardrop-shaped hoop earrings, handed down from Mom. Around my neck is a gold-tone chain with a fourteen-carat Snoopy pendant I have had since childhood; the back of it has my name inscribed in cursive. Once I am ready to change into an evening look, all I will have to do is apply some of the makeup that fills the bulging side pocket of my black leather purse. 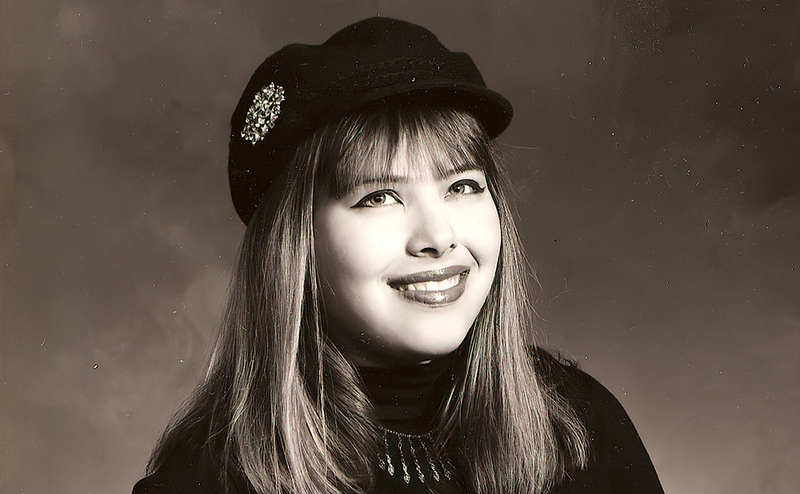 The fat black eyeliner there will give me the perfect retro raccoon eyes, and the pale-pink frosted Revlon lipstick will add authenticity. But to put on my makeup, I’ll need to find a restroom, which is going to be a challenge, as I don’t know my way around this cavernous old Newark church that goes by the strange name of St. Antoninus. And before I can find a restroom, I have to sit through the rest of this boring ceremony. Jennifer is sitting next to me, dressed far more sensibly in a white peasant blouse and tan skirt. Mom is in a long white frilly dress, but to see her I have to bob my head over the tall person in front of me, as she is all the way up on the bimah, or whatever Catholics call the stage area by the altar. The best I can make out is that right now an old priest in white robes is pouring water over Mom’s head. That must be the one who’s been teaching her Catholicism, Monsignor Oesterreicher. I nudge Jennifer. “Isn’t it great that Mom is finally settling into a normal religion?” She manages to suppress her giggle. Me, not so much. About five hours later. Once again I am bobbing my head, trying to see around the person in front of me. This is my life. Unfortunately, it is much harder to get a good sightline at the Ritz than it was at St. A’s. Here, the man blocking my view is not only tall but also has tall hair—three inches of platinum spikes—and he too is bobbing his head, only he is doing it in time with the music. At my side is Bill, resplendent in the vintage brocaded caftan I bought him—another birthday present. We have been together nearly nine weeks. That makes it the longest relationship I’ve ever had. Bill is two years older than me and publishes a mod fanzine, Smashed Blocked. He is just the kind of handsome, witty, musically aware boyfriend I have been dreaming of. But Bill doesn’t dream about me. A few days ago, he told me he had a dream about Liz, another girl from the mod/garage-rock scene. And he said Liz likes him too, plus she just broke up with her boyfriend. So this could be my last date with Bill. That is too much to think about right now. Sometimes it helps to have loud live music and nightclub lights just to be distracted from my own thoughts. Tonight’s music is not my favorite, but it is fun and mindless. The bleached-blonde guitarist launches into a familiar fuzzed-out riff, sparking a cheer from the crowd. It’s the one song they all know. Craning my neck, I catch sight of the singer prancing about, swishing his long brown hair like a corded whip. Oh, no. I forgot that when a band performs its hit at the Ritz, the technicians turn on the smoke machines for dramatic effect. It looks exciting from a distance but it is hard to take up close. An acrid cloud arises, billowing pink and purple beneath the stage lights, swallowing up the singer so that he seems to fade in and out of view. Cigarette smoke I can tune out, but not the chemical stuff emitted by the machines. Instinctively I rub my eyes. Before I can stop myself, half my eyeliner comes off onto my fingertips. A quick glance into my makeup mirror confirms the damage has been done. I am a stained mess. I mutter an obscenity under my breath. Five hundred people stand between me and the nearest source of water. There is no way I can get clean. 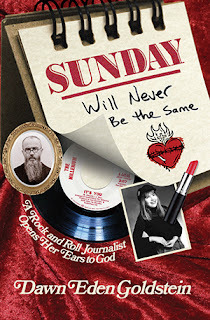 Excerpted and adapted from Sunday Will Never Be the Same: A Rock and Roll Journalist Opens Her Ears to God by Dawn Eden Goldstein (Catholic Answers Press). All rights reserved. What would it look like if we actually took the gospel into the secular public square? Please share this video message with your friends, family and community. Learn more at MTYR.org. Please share this video message with your friends, family and community. Learn more at MTYR.org.